Margaritas may have varying sugar contents depending on the type and ingredients that go into them, as well as the size. For example, traditionally made margaritas may have less sugar than those made with a margarita mix. Of these ingredients, the triple sec and lime juice do contain sugar. According the Self Nutrition Data, 2 ounces of lime juice contains less than 1 gram of sugar. DrinksMixer notes that triple sec has 10.9 grams of sugar per ounce. Therefore, a traditional 4-ounce margarita on the rocks has between 11 and 12 grams of sugar. This sugar content is the same whether the margarita is blended with ice or on the rocks, because the bartender uses the same liquor, mixer, and ice amounts. The only difference is one is blended into a slushie while the other remains on the rocks. Traditional margaritas made with a mix may have varying levels of sugar depending on the brand. However, while the mixes have sugar, in most cases they don't require the addition of triple sec, but only of tequila, which doesn't have any sugar in it. Therefore, the sugar content for various margarita mixes depends on the mix you use. Jose Cuervo Classic Lime Margarita Mix has 4.9 grams per ounce, according to Calorie King. Therefore, how much sugar you add depends on how much of the mixer you use. For a 5-ounce margarita with 4 ounces of mix and one ounce of tequila, the sugar content would be 19.6 grams, which is higher than a traditional margarita. A Skinnygirl Margarita is made with less sugar than other mixers. The cocktail is readymade and doesn't require the addition of any alcohol and mixers. According to Fitday, the Skinnygirl Margarita has 4 grams of sugar per 3 ounce drink. Therefore, a 4-ounce drink would have about 5 grams of sugar. While there are varying recipes for low-carb margaritas, LoveToKnow's low-carb margarita is low in sugar because it is sweetened with sucralose, a sugar-free sweetener. This margarita has less than one gram of sugar per 4-ounce serving. The table below allows you to view quickly the sugar content of various traditional lime margaritas. With this base recipe, you know that the triple sec and lime juice means the margarita starts with about 11 to 12g of sugar. The sugar from the fruit is additional. Refer to the chart below for sugar content in various flavors of 8-ounce fruit margaritas. Sugar counts for the fruits come from Self Nutrition Data and is calculated based on 1 cup raw fruit for all but the strawberry which is calculated using 1 cup of frozen, thawed, unsweetened fruit. The chart uses the sugar amount for the base recipe, as noted above, in the calculations. If you use a fruit-flavored margarita mixer, then sugar content will vary depending on the manufacturer. You'll note that because these mixers don't require triple sec (they only require tequila to be added), and they blend with ice instead of fresh or frozen fruit, an 8-ounce serving of a mixer will tend to have a lower sugar content than their fruit-filled counterparts. Master of Mixers Big Bucket premium strawberry margarita mix has 52 grams of sugar per 8-ounce serving. Jose Cuervo strawberry margarita mix has 24g of sugars per 3.5 ounce serving. Margaritaville mango margarita mix has 27g of sugar per 3.5 ounce serving. Baja Bob's strawberry margarita mix has 0g of sugar per 8 ounce serving because it is made with sucralose. Many fruit margaritas forego the salt around the rim and instead use caster sugar. This can add a bit to the sugar content of the margarita. It takes about a teaspoon of sugar for the rim of the glass, which adds 4.2g of sugar. 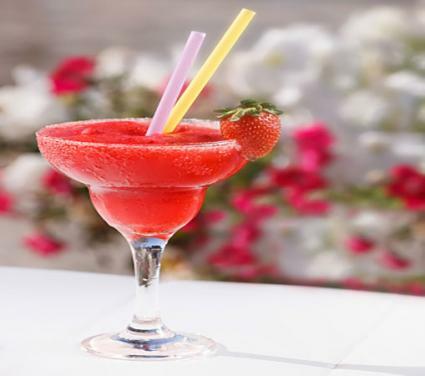 If you are concerned about sugar in your margaritas, then you may wish to consider some of the lower sugar options, such as the Skinnygirl margarita, the LoveToKnow low-carb margarita, or a margarita made with Baja Bob's mixes. It's also important to note that since you have little control over how bartenders make the margarita, it's difficult to know exactly how much sugar your drink will have if you don't make it yourself. Therefore, when watching your sugar intake, you may wish to make your own margaritas.